Wherever possible, this is expressed in verbs rather than nouns and adjectives as this helps to eliminate preconceptions. We might all have an idea of what a 'desk' might look like, but if verbs are used - write, file, store etc - there are many different ways these activities can be achieved. In other words, the writing of the brief can really contribute at the creative stage. There may be many influences all working simultaneously. Nature itself is a constant. From a designer's point of view, evolution demonstrates Nature's capacity to develop elegant and efficient structures. How long does the wood need to be cut and resting before you can use it - can you explain more about this process please? In the growing tree, the timber is fully saturated. It shrinks dramatically during seasoning, the process by which the moisture evaporates until it is in equilibrium with the surrounding atmosphere. This can be partially achieved by spacing the boards with fresh air circulating between them, but further drying is necessary to reduce the moisture content to 8% or less of the gross weight to ensure stability in a centrally-heated interior. 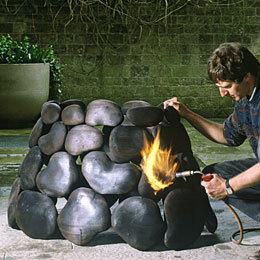 This is done in a kiln where the humidity and temperature are controlled. Natural seasoning will take about a year for every 25mm of thickness, whereas kilning will dry timber from 'green' in a matter of weeks. Sustainability is a complicated issue. Whilst the materials we use come from managed woodlands and the objects made will have an indefinite life and last for generations, the making does take a considerable amount of time and energy, neither of which is readily renewable. 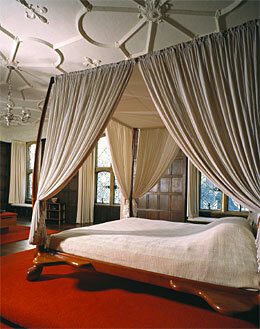 Sustainability is enhanced by designing and making objects of enduring quality and use. This issue will not be resolved until there are more effective ways of evaluating what we mean by sustainability. And when it comes to choosing wood and other materials? In Britain, 90% of our timber is imported. This dates from the time that extensive areas of our forests were cleared to fuel the Industrial Revolution; the manufacture of timber products moved to the ports where timber was entering the country. This destroyed the infrastructure of the internal timber-growing and manufacturing industries which has never recovered. However, there remain some well managed forest estates producing excellent indigenous timbers. The use of such materials is to be encouraged if we wish to see managed woodlands in our landscape. 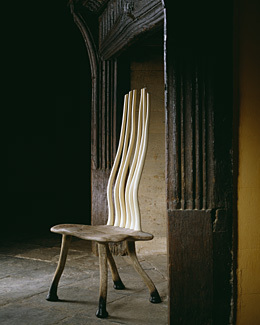 Can you describe from beginning to end how a piece of furniture - let's say a chair - is made? Describe where the design concept came from, what influenced you, how you decided on the wood or other materials or colour, how it was made and by whom and for who - what processes did you employ etc? 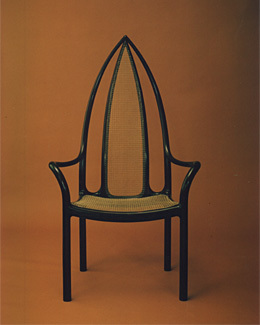 The brief for the six chairs called for a design that would complement the house, be comfortable and informal. The idea of a three-legged chair seemed appropriate, but we needed to prove to ourselves that this could be stable, strong and and comfortable. We wanted the seat to be structural, so there were issues about the method of joining the seat to the legs. The stresses on a chair are greater than any other piece of furniture. 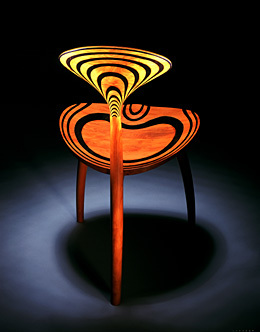 There was also the thought that it would be exciting to arrive at a design that was light, and comprised only of five basic elements - three legs, a seat and a back. The seats and backs were made of 2mm thick layers of yew-wood, alternating with 1mm thick bog oak, eleven layers for the seats, thirty one layers in the backs. 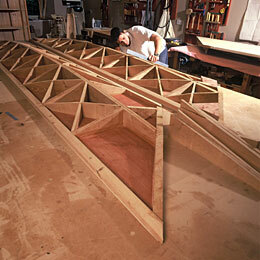 Each of these layers was made up of several widths joined edge to edge to make up panels the size of the seat and back. These were then glued and pressed over a curved mould, using a vacuum pump to extract the air from the air-tight bag around the mould and the laminations'. Maybe I'm unusual as a maker in being adopted by the design profession over many years (Fellow of the Chartered Society of Designers). My consultancy work in the Third World has been a valuable experience. Working as a client with world-class architects, structural engineers, material scientists and foresters has given me some broader insights to related spheres of knowledge. Why do you think the brand 'John Makepeace has been so universally successful? Travel has formed an important part of my education, first as a student then as a consultant. Exhibiting extensively has prompted international commissions. There may be some truth in the notion that there is enhanced recognition at home if your work is collected more widely. The fact that Parnham and the College rapidly became known around the world made a difference too. What is/are your greatest threats? It is hard to believe some of the changes over the last fifty or so years. Rationing after WW2 only ended in the 1950's, incomes were modest and living conditions were sombre. 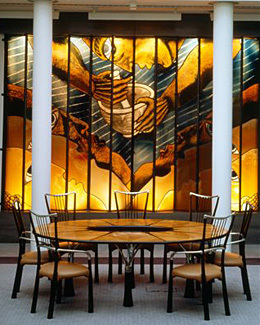 The Design Council was a rare oasis, and events like the Festival of Britain encouraged the hope for a brighter future. The furniture manufacturing and retail industry were focused on 'traditional' design, although contemporary Scandinavian inflences were beginning to appear. The crafts felt threatened with extinction, but the Craft Centre in Hay Hill sustained a beacon for the values advanced by the Arts and Crafts Movement. More recently, advances in computer capacity have revolutionised the availability of information and consumer choice, financial and stock controls, manufacturing systems and design methods. However, the impact of these shifts has not fundamentally changed the work of designer-makers, simply added new techniques that lead to new possibilities in design and production. . Working on my own since 2001, I have been slow to adopt technologies practised by staff beforehand. I now work with a part-time design assistant, who puts my design proposals onto computer. In some cases, these can connect directly to numerically controlled production systems. I do believe that the methods of drawing significantly influence how we conceive ideas. I have recently begun to work in series, where there is a theme being developed. 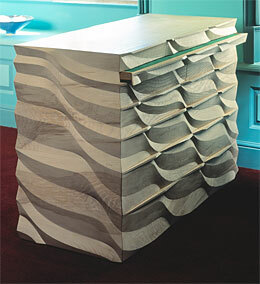 For example, some carved pedestals have led to the 'Flow' series of four chests of drawers all made from the same tree of ripple ash (see 'Windsor', 'Sand' and 'Flow' and images of 'Flow' and 'Sand' to the right). 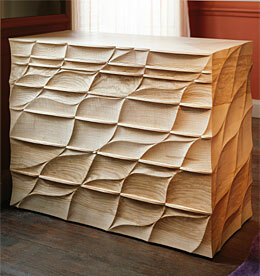 These all explore the idea of breaking into the surface of solid timber to reveal its three-dimensionality. 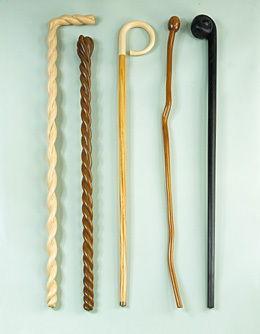 The patterns run round the object to emphasise the point that these are free-standing sculptural objects. 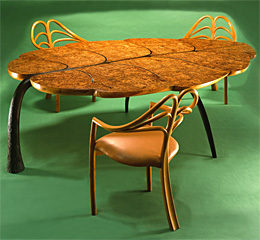 Another contender as a favourite is the 'Leaf' series of large dining tables with three legs - one dominant and two others flowing from the vein pattern in the table top (see 'Mulberry' and 'Spring' and images of these tables to the right). 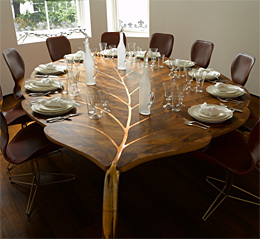 The lobes of the leaf provide spaces for each person, the edges are sculpted away and naturally prompt a level of engagement and curiosity as the table appears to float. Not formally, but practice has brought me into contact with a number of inspirational mentors either as clients or professional advisers. They have been instrumental in the 'discoveries' which have been a constant factor in my career to date. See 14 above. (See page on commissioning and 10, above). Most aspects of working on commissions are enjoyable, especially discussing new projects with clients, wrestling with the multiple design issues, selecting the specific materials, refining details during the making and the critical analysis on completion. 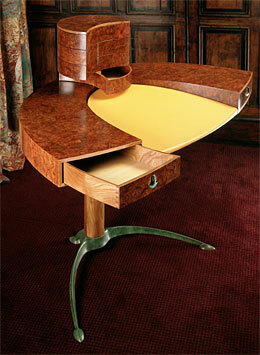 If you weren't a furniture designer and maker what would you have liked to be? It has become increasingly apparent, from seeing the work of thousands of design graduates, that the quality of their ideas is hampered by an inadequate understanding of materials and processes. Practical, hands-on experience of materials can stimulate the more abstract ability to generate exciting concepts. The two are mutually beneficial. 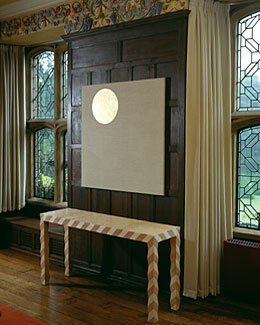 I hope my work will encourage others to consider a career as artists and makers of extraordinary furniture.